Uglyworld #207 - The 3 Wise Uglies, originally uploaded by www.bazpics.com. Having hidden in the shadows since their arrival last night (you can blame Ox for not noticing them, he was too busy playing on his skateboard) the 3 individuals approached me today to ask some advice. 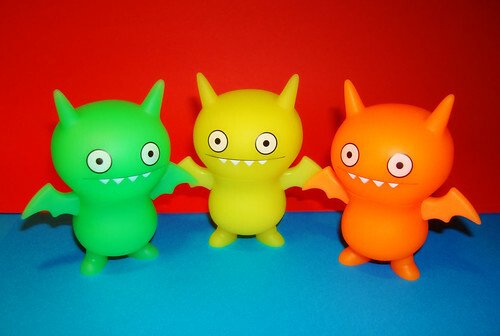 It turns out that at this time of year in Uglyworld it's normal for "3 wise uglies" to be sent to visit some of the other uglydolls who live amongst humans and bring with them each a gift. I asked them if this mean that they would bring gifts like Gold, Frankincense and Myrrh detailed in the bible - the 3 of them just started laughing at me and I had no idea why. After the one-sided mirth died away they announced that they were not carrying such gifts as this, so I asked them where the gifts were and they immediately got embarassed. I had to push them a few times before they were willing to answer my question. Yellow Ice-Bat said he was carrying Swiss-Roll, Green Ice-Bat said he had been carrying Black Forst Gateau and Orange Ice-Bat said he had been carrying some Chocolate Chip Cookies. I pointed out to them once again that they were standing there with no gifts to which they replied, "It was a long journey from Uglyworld and we got hungry, so we had to eat them - but they were very very very tasty!!! ".